F a s t S h i pp i n g , E x c e ll e n t F e e d b a c k! 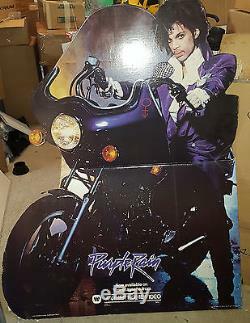 Up for your viewing pleasure is this GIANT (about 52" H x 40" W) Prince Purple Rain cardboard promotional advertising display piece. After Prince had passed away, there were/and still are a number of different companies reproducing knock off pieces. This here is the original Warner Brothers 1984 promotional stand that they stuck in all of the movie rental stores when Purple Rain came to video cassette. It was obtained when one of the last local rental stores closed its doors and this was sitting in the back storage room. For nearly 34 years old, it is in remarkably clean condition. No, it is not quite in mint condition, but the colors are very nice, the turn signal on the motorcycle is still attached (where a few have been offered before but had it missing/broken off), and there is just very, very minimal slight wear around some of the edges. You really can't put a price on such a sought after collector piece. This is the perfect addition for any Prince fan, for that home theater, memorabilia room, etc. Own the rare 1 of a kind today! When it's gone, there's no telling when or if one will be offered like this again. Thank you for your interest and looking! WHAT YOU SEE IN THE PHOTO(S) IS WHAT YOU WILL RECEIVE. The item "PRINCE PURPLE RAIN MOVIE 4FT STANDEE STORE CARDBOARD DISPLAY MEMORABILIA POSTER" is in sale since Monday, February 27, 2017. This item is in the category "Entertainment Memorabilia\Music Memorabilia\Rock & Pop\Artists P\Prince\Posters". The seller is "inventoryspecials" and is located in United States. This item can be shipped to United States.